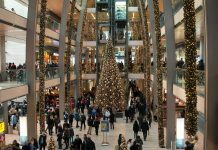 Datorită culturii teologice profunde și a operelor care au lămurit aspecte importante din învățătura de credință creștină, sfinții Trei Ierarhi sunt considerați patronii spirituali ai școlilor de teologie ortodoxă. Every year, on January 30th, the Orthodox Church celebrates the hierarchs Basil the Great, Gregory of Nazianzus (Theologian) and John Chrysostom (Golden Chrysostom). Even though each of these saints has his own day of feast , the need for this celebration arose as a result of a rather embarrassing dispute for the Christian community. 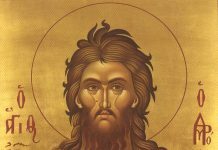 Somewhere around the second half of the 11th century, there was a dispute, let’s call it “unjustified,” about the importance of these saints. Some claimed that St. Basil the Great is more important than St. Gregory of Nazianzus and St. John Chrysostom, others that St. Gregory deserves this honor and finally the third group considered St. John as the most valuable. The matter had become quite serious, that even hatred between members of these factions had occurred. 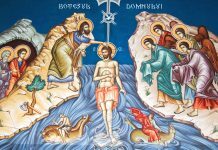 In this context, the Sinaxar tells us that Metropolitan Ioan Mavropous (the last great Christian hymnographer) of the city of Evhaita had a vision in which the three saints appeared to him and told him that they were equal before God. Therefore, he was urged to establish a common feast for them, so that the preference dispute would cease. This vision, according to Tradition, took place during the reign of the Byzantine Emperor Alexios I Comnenus (1081-1118). 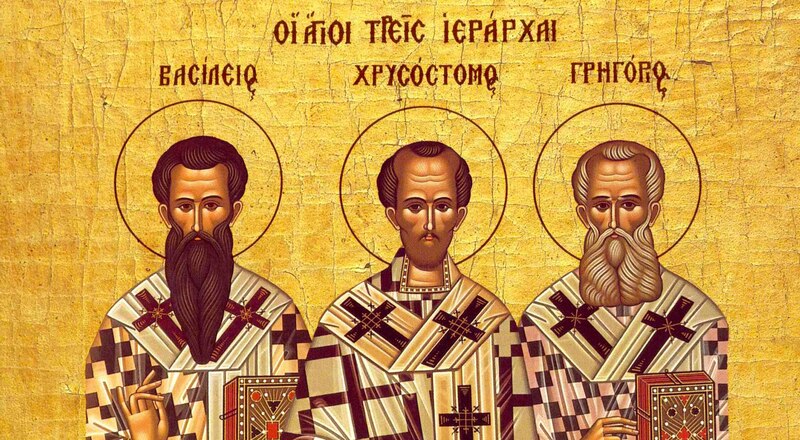 To express the uniqueness of each of the three great hierarchs in the Eastern Christian tradition, a phrase has been used that compares Saint Basil with the working hand, St. Gregory with the thinking mind, and John with the mouth that speaks. St. Basil the Great came from a wealthy family who had the possibility to provide him with a very high education. This was the basis for the later transformation of Saint Basil, who, during his studies in Athens, came to be a very good friend of Saint Gregory of Nazianz. This friendship has remained, until nowadays, a landmark in Christian history. After an ascetic passage in Egypt and other places of great spiritual experience, Saint Basil became the author of the “Great Rules” and “Small Rules” on the life of the monks and, based on them, laid the foundations for monasteries. His theological knowledge is highlighted in both the interpretations he has left us about the Genesis (Hexaimeron) and the Psalms, but especially in the theological treaty, which is dedicated to the Person of the Holy Spirit. In addition, he is the author of one of the three variants of the Liturgy used today in the Orthodox cult and the famous ritual of exorcism, which is read on 1 January (Saint Basil’s day of celebration) and on special occasions. St. Basil the Great became Archbishop of Caesarea in Cappadocia and, as such, proved a great inclination toward the practical side of Christianity. Thus, he is the one who set up the first social work facilities, where protection and care for widows, abandoned and sick were offered. These settlements have remained in history under the name “Basiliada”. Thus, his qualities as a good organizer and founder of several monasteries and social work establishments brought him the “working hand” appellation. St. Gregory was born around 330 in a Christian family, his father being a bishop. This, coupled with the fact that his family was able to support him financially during his studies, helped Gregory deepen the Christian teaching in an extraordinary way. This is how, after a period of fleeing the priesthood, due to the great responsibility of this ministry, he eventually became a priest at the Church of the Holy Resurrection in Constantinople. The situation he met in the imperial capital was far from being a favorable one. The Macedonians (penvmatomahs), who denied the divinity of the Holy Spirit, were majority. The only island of Orthodoxy was the church where St. Gregory was priest. But from the church pulpit, this great hierarch would make history. “The 5 Theological Lectures” which he spoke remained a model of theological reasoning and overturned the situation in favor of those who claimed that the Holy Spirit is true God. This draws the attention of influential people from the imperial court, who intercede for him to become patriarch of Constantinople, being enthroned by Emperor Theodosius himself on November 27, in the year 380. From this position, Saint Gregory was to participate at the working sessions of the Second Ecumenical Council (Constantinople, 381). Then, forced by the intrigues of some bishops with great influence in the court, and in order not to cause disorder among his followers, Saint Gregory left the patriarchal seat and retreated to Nazianzus where he dedicated himself to a life of intense prayer. Also, in the case of this saint, the appellation is a fully deserved one. From no Christian writer or orator we have as many works as St. John Chrysostom left. Like St. Basil the Great and St. Gregory of Nazianzus, St. John came from a family with financial possibilities. After being a widow at a very young age (about 20 years old), Antusa, his mother, renounced to remarry and devoted herself to educating her son. The fruits of this endeavor did not cease to appear, and after a period when his mother instructed John, he attended the courses of the great orator Libanius and the philosopher Andragatis, whom he impressed with his rhetorical talent. After several years of ascetic life, bishop Meletius of Antioch ordain Saint John deacon, and during the next six years, he wrote the famous treatise “On Priesthood,” considered one of the most beautiful descriptions of this Sacrament. Afterwards, he is ordained priest with the mission of being a preacher, and for 12 years, he combats in his sermons the heretics and influences of Judaism on Christian life, which contributes to a significant extent in raising the level of Christian morality in the region. His fame grew bigger and, in 397, the minister Eutropius interceded for him to become Patriarch of Constantinople in the vacant place following the death of Patriarch Nectarios. Unfortunately, for St. John, the reality he faced from this position was a rather complicated one for a man who did not like to mimic morality. Thus, he entered into open conflict with Empress Eudoxia and Patriarch Theophilus of Alexandria. Through an elaborate intrigue, Theophilus manages to exile St. John, but he is recalled after a rebellion of believers who were asking for their shepherd and following an earthquake that was considered a divine sign. However, after two months, Theophilus manages to convene a synod who deposed hands over St. John from the patriarchal dignity. Afterwards, it was decided for him to be exiled in Cucuz (Armenia). However, because John still had important friends, both in Constantinople and Antioch, he is relocated. He died while traveling from Cucuz to Pityus on September 14, 407, with the last words “Glory to God for All”! Apart from the sermons and the emblematic interpretations of the Gospel of Matthew and the 14 Epistles of the saint apostle Paul, St. John remains in Christian history for his exorcism ritual, but especially for the Liturgy ritual, which is the most commonly used in the Orthodox cult. These three great personalities of Christian ascetic theology and life have remained in history as shining stars who can guide us through the turmoil of life. Although they had important positions within the hierarchy and church administration, they were people of profound Christian living. They had a visceral hatred for everything that is sinful, but they showed tremendous love for sinners. As you can see, holiness is not gained only by isolation in the wilderness and living an ascetic life. It implies, first, the serving of others and the fight against immorality. The three great hierarchs had these in common and, because of these, they suffered. Nevertheless, they continued to fight! One of the important ideas that we should learn from this feast is that the difference between us, the ordinary people, and the great personalities of Christian history lies in the fact that the latter did what was right, regardless of the consequences. St. Basil the Great is celebrated on January 1, St. Gregory of Nazianzus on January 25, and St. John Chrysostom on November 13 and January 27. A collection of accounts of the most important events in the saints’ lives that are ordered according to the feast day of those saints. Because of their remarkable contribution to the deepening of Christian theology, they are considered patrons of theological schools and theologians.